Here are two photos, taken from the Rialto, about twenty-five years apart. 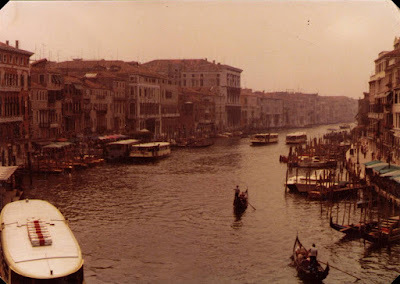 The first one was taken in 1981 when my wife was in Venice with her family. The photo process alone ought to tell you which one is from the 80's. 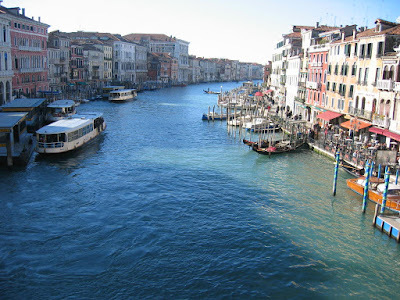 The second photo is one of Sean Antonioli's - it was taken a few years ago when he was living in Venice. One other difference is that Sean took his photo in winter, while the 1981 shot was taken in summer. There are several details that differ between the two versions of the same view. Awning, umbrella, and chair placement varies, but season may have something to do with that. The differences in palina and dock locations caught my eye. Vaporetto stops and the vaporetti themselves appear to be the same, although I believe we are looking at updated versions of each in the newer photo. And it appears that a lot more people in Venice use cable TV now as opposed to aerial antennas - there's a whole collection of them in the older photo. Anybody see something else worthy of mention?